Review; The Real Band of Brothers - first-hand accounts from the last British survivors of the Spanish Civil War; Max Arthur - Collins, UK, 2009. Though Max Arthur is listed as the book's author, the real authors are the eight veterans whose accounts of their experiences as International Brigaders make up most of the book. (The book's subtitle is also inaccurate, as two of the accounts are from Dublin volunteers.) Arthur conducted and edited the interviews and supplies four pages of Preface and a 'Timeline of the Spanish Civil War'. He is an oral historian specialising in military history, including two recent best-sellers of reminiscences of World Wars I and II. Considering Arthur is a popular historian (and that the book is a tie-in/spinoff from a History Channel documentary) it might be surprising - or predictable but depressing - to see the inaccuracies he can get away with presenting to his readers as 'history'. But the clue is already there in the opportunist title - 'Band of Brothers' is a reference to a popular TV series of 2001 which dramatised a US Army Company's 'heroic adventures' in Europe during WWII. The present book is deliberately cast in the same light, to be seen as portraying a similar struggle to defend bourgeois democracy. 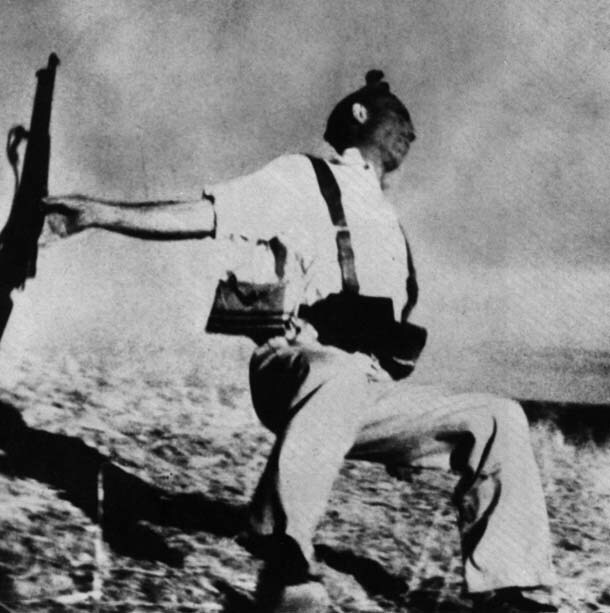 But any 'historian' who reduces the Spanish Civil War to only one of its competing political currents - and so ignores the revolutionary Anarchist and Marxist currents in Spain who tried to push for a social revolution - is clearly too lazy to inform themselves of the historical facts and/or being deliberately deceptive. But I guess it depends on whether you are intending to deliver informative and accurate social history or merely military adventure as dramatic heroism and entertainment following a commercially successful formula. Nothing is ever put into wider historical context - for this book the War was simply about defending the democratic Republic against the nasty Fascists. The CNT anarcho-syndicalist union - the most powerful organised working class force in the period leading up to the Civil War - is not even mentioned in the book. Anarchists are mentioned twice in passing; firstly as failing to appreciate the necessity of conventional military training - ignoring the heated political debates and conflict over whether the workers' militias formed in response to the Fascist uprising should be hierarchically reorganised into a conventional standing army. I remember one incident vividly. An old Spaniard shouted, 'Yo lucho para libertad!' (I fight for liberty), as he dug in alongside me. The ground was hard and stony and, even with the aid of a trenching tool, it was only possible to dig a shallow strip. We had to use what natural cover was available. Laying his trenching tool on the ground, he picked up his rifle to fire at the opposing force. Franco's men sent back a hail of rifle and machine-gun fire. I looked at the unlikely soldier by my side and marvelled at his courage. He had a gnarled, bronze face, a heavy body, and was wearing the cap and overalls of a working man. He was afraid of nothing. It turned out he was an anarchist, but he typified for me the resolve of so many Spaniards, who hated the idea of a Fascist takeover. In his courage, he was reckless - a recklessness which did for him for he was killed by the return of fire. He was shot in the head and died quickly. Others around me dragged him away and later buried him in a rough, shallow grave. I kept on firing, and it was only luck that saved me from the same fate. I established a link with him which I maintained afterwards - he was always very friendly, more so than some of the Labour Party. I say that now - but I wouldn't have said it at the time. I found I identified more with Ted Heath than with Harold Wilson, for example. Jones' view of the Civil War are typical of the book and consistent with his later union role; a commitment to a defence of a left-wing version of the bourgeois democratic state. The veterans interviewed in this book are all from working class backgrounds. The only real historical contribution of the book is to describe the beginnings of their political commitment and in doing so provide some interesting descriptions of working class life and its political culture in the early 20th century. Their stories and motives are probably quite typical of the 2,500 British and Irish men and women who fought for the Spanish Republic. They felt strongly that the 'legitimately elected government of Spain' should be defended and that the Fascist threat they had seen at home - Moseley's Blackshirts and the Irish Blueshirts - would be strengthened by a Fascist victory in Spain. The bravery and commitment to a Cause are clearly heartfelt in the veterans' accounts, but there is little to distinguish their stories from other accounts of rank'n'file soldiers in WWI and II. We hear of the same bravery, comradeship, horrors, futile deaths, fascinating details of daily life and endurance under absurd and grotesque circumstances etc. Of political clarity or development there is little or none. The composition of the Government - including CNT Ministers (who quickly abandoned their anarchist anti-statism as soon as it was put to the test) alongside Stalinists - is not dealt with. The Civil War is described as a morally correct war effort, with the revolutionary aspirations of some sections of the Spanish working class completely ignored. The political tensions this created - culminating in the Barcelona May Days of 1937 where Stalinists and Republicans fought it out with revolutionary Anarchists and Marxists and finally crushed the last revolutionary impulses - are never mentioned directly. There is no expression of revolutionary sentiment or desire in the accounts, just a desire to defend a left-wing democratic regime. One gets the impression that these volunteers went to Spain, were allotted their tasks, carried them out in the trenches and hospitals - while 'the politics' was something happening elsewhere that was not their concern, taken care of by specialist representatives of party, union and government. Beevor's quote shows the attitude of Stalin's Russia from the very start of the Civil War in 1936. In pursuit of its own foreign policy interests, Stalin's 'advisors' in Spain actively worked to prevent revolution and - largely by developing a popular alliance with the petit bourgoisie and middle class - to limit the struggle to defence of bourgeois democracy; Stalin sought closer relations with Britain and France in alliance against the looming threat of Fascist Germany and Italy. The Russian propaganda machine portrayed the events in line with these goals. He also wanted to see a mutually destructive war between the major powers that he could observe from the sidelines until ready to take territorial advantage of the weakened condition of rival states. Stalinism as an ideological force may now be dead but its myths linger on in crass stupidities like Max Arthur's book. The classic liberal-democratic and Stalinist line on the Civil War - that Orwell had already discredited (in Homage To Catalonia) soon after the Civil War ended - is served up as assumed truth. 1937 - 10 May - A Nationalist uprising in Barcelona is put down by Republican troops. The simmering conflict within the Republican camp between revolutionaries and Republicans - the “civil war within the civil war” - reached its peak in the May day clashes when the government moved against the anarchists' occupation of the Barcelona telephone exchange. The situation of dual power - between the capitalist Republican coalition government and Barcelona as a stronghold of armed workers' power - could not last. After several days of fighting and with the help of CNT Ministers, who pursuaded workers to lay down their arms, it became a terminal defeat for working class power and its revolutionary aspirations and a victory for the capitalist Republican state in alliance with its Stalinist allies. Arthur's dumb repeating of standard Stalinist lies - that this was a fascist-manipulated "Nationalist uprising" crushed on 10th May (when fighting actually finished on the 7th) sums up well the stunning ignorance and incompetence of this dunce of a "popular historian"; and reminds us that the defenders of this world still need to falsify the truth of historical radical challenges to their preferred form of social organisation - miserable scribblers like Arthur are merely their willing vehicles. And so the accumulated repetition of these lies attain the reputation of popular easily-sourced assumed truth. All that can be said in the book's favour is that the volunteer's accounts are mildly interesting descriptions of conditions and attitudes of the time. But there are shelves of more reliable and useful books on the subject with a grasp of the political realities; such as those by George Orwell, Burnett Bollotten or Anthony Beevor. But this reminds us of the enduring importance of a contemporary eye-witness work like Orwell's Homage To Catalonia - both in its immediate historical moment when it had to be denounced by the Stalinists and the majority of their fellow travellers of the left-wing intelligentsia - and ever since as a corrective to the garbage spewed out periodically by hacks like Mr Arthur. Source; The Whinger - Irregular Libertarian Socialist Rantzine, No.8, Summer 2010, UK.